Sometimes, when you’ve collected all the wort you’re going to for a big beer, there are still sugars left behind in the mash tun. If you’re all-grain brewer, you’ve probably made a second beer sometime. You may have brewed a big beer then and realized that you had plenty of sugar left in the grain bed. 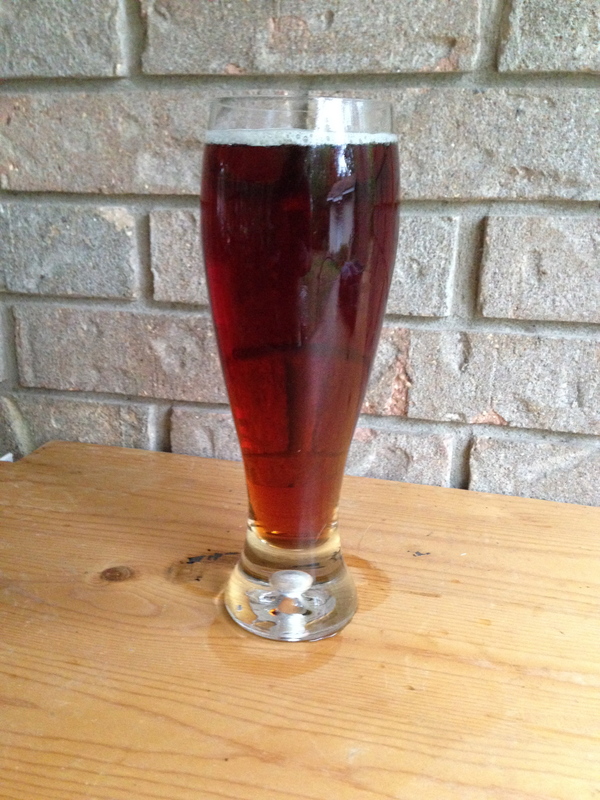 After rinsing it out with hot sparge water, you made a second beer. Alternately, you may have read about what some homebrew source described as parti-gyle brewing — brewing a big beer from the first wort and a second beer from the sparged wort — and given that a try. If you did, you were probably disappointed. I know I was. The first few times I tried this, the second beer was grainy and lacking in malt aroma. Overall, it had an iced-tea-like character. Not to put too fine a point on it, but the beer wasn’t any good. As it turns out, there’s a reason why a beer made entirely from wort collected late in the runoff will not be of good quality. However, there is a way to brew a decent second beer (and actually practice parti-gyle brewing in a manner that more closely matches how commercial brewers did it). In order to understand why a second beer made only from sparged wort is bound for failure, let’s examine what happens when you mash and run off the wort. At the end of your mash, you have a vessel full of grain husks sitting in the surrounding wort. When you start running off the wort, before any sparge water has been added, it is called first wort. First wort has the following characteristics. It is relatively high in specific gravity. The exact specific gravity depends on your mash thickness and extract efficiency, but values in the ballpark of 21 °Plato (around SG 1.087) are common in homebrewing. Not only is the first wort high in sugar, it is relatively high in soluble protein (compared to the later, sparged wort). 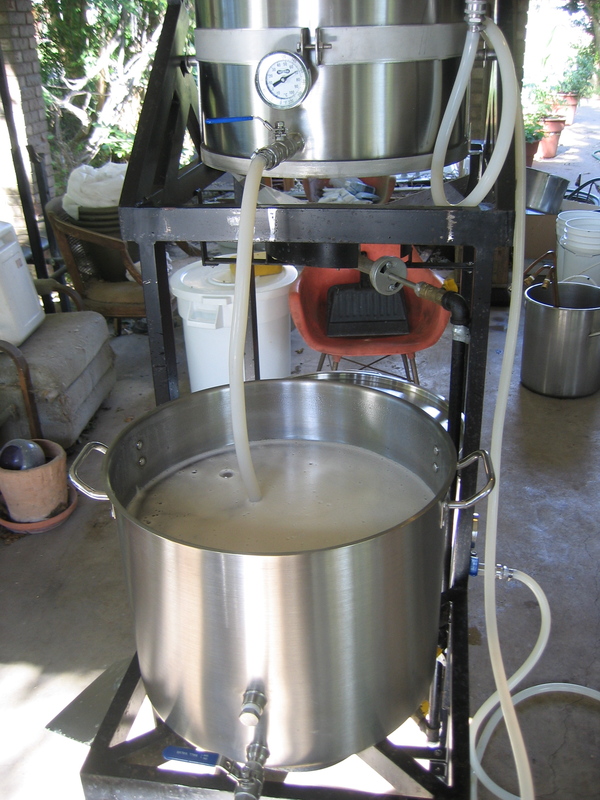 The pH of first wort is the same as mash pH, ideally 5.2–5.4. It is partially because of this comparatively low pH that the first wort is low in tannins (and silicates). Also, as your nose can confirm on any brewday, the first wort is highly aromatic — it smells intensely of malt. First wort is rich in malt sugars, and smells wonderful. If you batch sparge, there is a discrete boundary between your first wort and your second wort (and perhaps also your third wort). They are collected separately, even if they end up in the same kettle. If you continuously sparge, the first wort blends into the second, sparged wort at some time early in the runoff. In either case, sparged wort — and especially the final runnings in the case of continuous sparging or the third wort in the case of batch sparging — has the following properties, compared to first wort. Sparged wort is lower in specific gravity and proteins. The latter is evidenced by poor break formation in beers made from sparged wort. The pH is higher, and can fall in the 5.5–5.8 range. Because of this, sparged wort is more tannic (and also has more silicates). You can confirm the presence of tannins simply by tasting the final runnings in a continuously sparged wort. 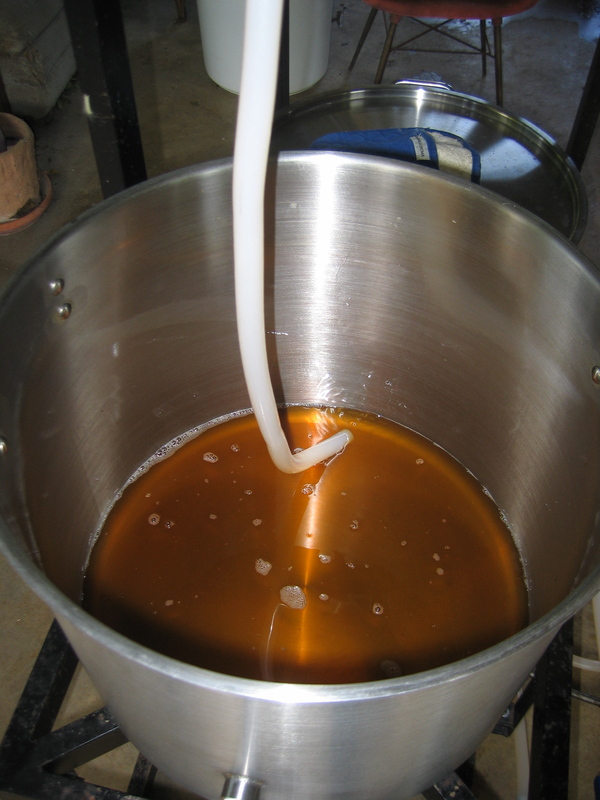 You will also notice that sparged wort is much less aromatic than first wort. As I mentioned, wort made solely from sparged wort often shows weak break formation. The lack of protein in the wort may stress the yeast and lead to an unordered fermentation, sometimes with the production of off odors. 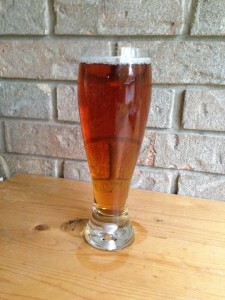 In addition, the resulting beer lacks in malt aroma and usually tastes grainy, if not feeling outright astringent. However, there is a way to fix this problem — blend in some first wort. There are a variety of ways you can improve the sparged wort to the point that a worthwhile second beer can be made from it. If you’ve collected both worts and have them both sitting side by side in different kettles, the obviously solution is to take a portion of the first wort and blend it into the sparged wort. (Likewise, I would argue that blending some of the sparged wort into the first wort will improve it’s quality, at the expense of decreasing it’s specific gravity. But I’ll save that argument for another article.) Another obvious solution is add malt extract — condensed wort — to the sparged wort. 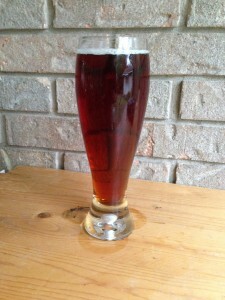 This helps in some respects, but does not always yield a beer with sufficient malt aroma. The wort for your first beer will have everything needed to brew a great beer. Brewers who batch sparge could stir some extra crushed malt into their grist when they add the sparge water. After letting the new grains be mashed, they could run off the second wort. 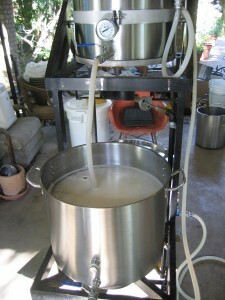 If they only had one wort chiller, the time spent mashing could be a positive thing as the batches would be staggered. In a somewhat similar fashion, and regardless of how you lauter, as the sparged wort is being collected, it could be heated slightly and a bag of crushed grains could be “steeped” in it. This would essentially be making a BIAB beer using sparged wort as brewing liquor. If you continuously sparge, you can collect the first few gallons of first wort. Then, when the specific gravity starts dropping, collect the remaining several gallons of sparged wort. You’ll always have a larger volume of sparged wort than first wort. After collecting the worts, you can blend them. However, you can also do the blending on the fly. For example, imagine that you’ve divided the wort collection period into three periods. During the first time segment, you run off wort to the first kettle for 2 minutes for every minute that you run off wort to the second kettle. In other words, in the first time period, you end up with one kettle having twice the volume of first wort and early wort, compared to the second kettle. For the middle time period, direct wort to the first kettle and second kettle evenly — for every minute of wort the first kettle receives, the second kettle also receives a minute’s worth of wort. (Obviously, we’re assuming the flow rate to be roughly constant during wort collection.) Finally, in the final time period, give the first kettle a minute’s worth of wort for every two minutes the second kettle receives. The end result will be equal volumes of wort, with each kettle being a blend of first, middle and late worts. The first kettle will have a higher proportion of first wort and a lower percentage of late wort, with a correspondingly higher specific gravity. To make a worthwhile second beer, you need to blend some first wort into your sparged wort. Otherwise, the beer will have no malt aroma. In tomorrow’s article, I’ll give some examples giving volumes of wort and their specific gravities for two different scenarios. In the first, we’ll look at brewing a small volume of big beer from the first wort, but using enough first wort to rescue the much larger second wort. In the second, we’ll look at brewing roughly equal volumes from two worts at different intermediate gravities. What do you mean by “unordered fermentation”?? An ordered fermentation is one that starts within an appropriate amount of time, proceeds smoothly and reaches the expected terminal gravity in a reasonable amount of time. An unordered fermentation may take too long to start, may proceed too slowly or erratically or stop prematurely, may never reach the target terminal gravity, or some combination of those. Good question. I should have defined ordered fermentation. I brew ten gallon batches. So, most beers I batch sparge with about 8 gallons in the first batch and second batch. I end up getting about 4-5 gallons first runnings, and about 8 gallons in the second. As a batch sparger, would you recommend keeping the third sparge roughly the same volume as the second, or smaller? I am thinking it would make the most sense to add a couple pounds of grain to the mash tun along with the third sparge since I only have one chiller. If I used the same volume of water as the second sparge, I would end up with a slightly lower volume off the third. Do you have a recommended percentage of original grist you would add for the third batch? If you batch sparge and collect three batches — a first wort and two sparged worts — I would recommend collecting the same volume for each batch. If you mash at 1.25 qts./lb. (2.6 L/kg) and collect 3 worts, you end up with a volume of wort equivalent to that from a fully-sparged grain bed via continuous sparging. (Actually, just a bit short, but very close.) Whatever volume of first wort you collect, add that amount of sparge water for your two batch sparges. The liquid level in your mash/lauter tun will be the same each time if you do. The amount of wort you collect each batch will be the same, too. If you are going to make a separate beer from your last batch (or a separate beer from all three), adding some grain to the mash tun before collecting the last wort would be a good idea. I would add enough grain so that the new grain comprised about 25% of the (dry weight) of the total grist. [So if you had 10 lbs of grain, add about 3.5 more, because 3.5/(10+3.5) = 0.25.] This would mean adding more water. And, I would not stir the new grains into the old ones — let the new malt mash on top of the old grains, then stir them in before recirculation. Did that answer your question? I wasn’t quite sure I understood you plan. Thanks for another great article (series)! Explains a lot about a couple bland beers in my pipeline. I typically run a stout or porter in the second runnings by adding some roast and crystal, but they are still clearly lacking something. Base malt goodness I guess. I am with Jake — big mash tun (77 quart cooler), but boiling/chilling limited. So capping with base malts in addition to my usual color additions may be my best bet. Can you give us any guidance on how to think about capping? How much new grist to make a difference? Do typical mash parameters matter? If so, how to pick a temp and for how long? Also how do you figure out how to get to the target temp? I’ll preface this by saying that I haven’t tried it, but here’s how I would do it. If you’re going to make a beer from your second or third batch in a batch sparge, I would add enough fresh malt that it constitutes about 25% of the new mash. I would add a mix of sparge water (assuming it’s 170 °F/77 °C or hotter) and cool tap water to the existing wet grains to reach your target mash temperature (even though you haven’t added the new grains yet). Your grain bed is already warm, so your sparge water would need to be close to the mash temperature you choose. Next, I’d then use a mix of sparge water and tap water to mash in the new grains. Your sparge water is probably just a bit too warm for this, so only a little tap water would be needed to cool it down. I’d just layer the new, crushed grains on top of the existing grain bed rather than stirring them in. I’d stir in about a pitcher of new grains and a couple pitchers of water at a time. And yes, you’d want to be in the usual single-infusion mash temperature range and usual range of mash thicknesses. (If your grains are all in the mash tun, and you’re at the right temperature and there’s a little layer of water atop the grains, you should be good.) Let the mash go as long as you normally would, or periodically try an iodine test. The easiest way to adjust the temperature of your sparge water and tap water mixes would be to take an extra pot or bucket, scoop some sparge water into it, then slowly stir in tap water until you hit your target temperature. After the mash, I’d stir the grain bed together and let it sit for 5 minutes before proceeding to recirculation (or mash out and then recirculation). Also..What is your thinking on the reason to not mix the new grist into the first run grist? Are the enzymes from the first run spent/tired? My idea is just that all the fresh grain is lumped together in one mass in the “refresher” mash. That way, the starches and enzymes are initially in physical proximity (although they will diffuse away as the mash progresses). Hi, and if you add the half weight of malt of the first mash?